This page presents general information about model railroad wiring techniques including how to use bus wires, how to make connections, connecting track feeders, splicing, using terminal strips, crimp connectors, and a link to a page on turnouts. There are basically 2 types of wires that can be used for model railroad wiring - solid or stranded. The stranded type is more flexible and perhaps less likely to break or crack with repeated bending. However, I like the solid wire much better because of the ease of connecting it to screw terminals and mostly because there aren't any strands that can "wander over" to a nearby terminal and cause a short circuit. Selecting the right gauge is important. If the wire gauge you're using is too small for the application, there will be too much resistance in the wire and this will either cause the device not to work properly or, worse, the wire may heat up too much and become a fire risk. Certain tools are almost a necessity for model railroad wiring. 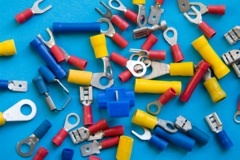 These include wire cutters, wire stripper, crimping tool, wire tester and a selection of wire nuts, crimping connectors, splice connectors and soldering tools. In regular block wiring for cab control, you can use a bus for the common (negative) wire. In this case, you run the bus wire all around the bottom of your layout usually under the plywood base. Then run track feeder wires from the common rail of the track to the bus. Usually it’s best to have a track feeder for about every 3 feet of track to assure that adequate current gets to all areas of the track throughout the layout. You can connect each track feeder to the bus using a terminal strip (sold at Radio Shack). Or you can strip the insulation off a small section of the bus wire, then wrap and solder the feeder wire to the bus wire. Or you can use tap, or suitcase connectors, if you can find any, to make the connection. For DCC wiring, you can have bus wires for both the positive and negative wires going all around the layout. Then connect feeder wires from the track rails to the appropriate bus, joining positive rails to the positive bus and negative rails to the negative bus. This makes model railroad wiring for DCC much easier, because you don’t have to have multiple blocks with separate feeder wires going from the positive rails to switches on your control panel. The only problem with using bus wires for DCC is that if you get a short circuit somewhere, the whole layout shuts down. This is why many people recommend that if you have a large layout, you should separate your track layout into electrical blocks that are connected to circuit breakers then on to the booster unit. That way, if you have a short circuit, in one block, it will trip the circuit breaker for that block only and the rest of the layout will still be functional. You can then narrow your troubleshooting to that section of the layout connected to that circuit breaker. How do you attach feeder wires to the tracks? Specially-made wired metal rail joiners can be purchased and used as track feeder wires for your model railroad wiring. However, I usually do this myself by soldering one bare end of the 18-20 gauge feeder wire to the outer side of the track rail after I have threaded the wire through the layout. The other end of the feeder wire can be attached to a terminal strip on the bottom of the layout, or to a bus wire, or spliced to an extender wire to carry it back to a switch on the control panel. How do you splice the ends of 2 wires together? 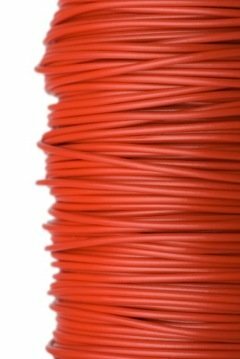 One method is to place a section of heat shrink tubing over one end of one of the wires, then wrap the bare ends of the wires tightly around each other, then solder them. Then move the heat shrink tubing over the connection while the solder is still fairly hot. You can also use the side of the soldering iron along the heat shrink tubing to heat it if necessary. Another method is to put a straight splice connector over one of the wires, wrap the bare ends of the wires together tightly, then slide the splice connector over the connection and crimp it using a crimping tool. How do you thread small gauge wires through several layers of extruded foam and plywood to get from the surface to the underside of your layout? If you’ve ever tried to do this, you know how difficult it is. The best method for doing this is to get a long drill bit at least 3-4 diameters larger than the wire. Drill the hole through to the bottom of the layout. Then insert a metal tube, which you can buy at hobby stores, through the opening to the bottom. Then thread the wire through the tube. If necessary, you can attach a small fishing weight to the wire to help pull it down through the tube. Once the wire is through the tube to the other side, you can slide the tube out, leaving the wire in place. Terminal strips are just strips of plastic with screws lined up on either side where you can fasten wires. Barrier strips have a small shield of plastic between each wire so the wire strands won’t wander over onto the wrong connection. Push-in type terminal connectors are designed so that you can just insert the wire into a hole, then drive a flat-ended screw on top of the wire to hold it in place. Crimp connectors can be crimped onto the bare ends of wires to use as a neater way of attaching wires to screw terminals. These can be rounded or U-shaped, depending on how secure and/or permanent you want the connection to be. The U-shaped ones are easier to connect and disconnect without having to take the whole screw out each time. What kind of electrical switches do you use when? Check out the page on the more common types of electrical switches used in model railroading, including a discussion about Atlas switches. How do you wire remote turnouts? There is another whole page on this site devoted to this topic, called “All About Turnouts”. All the wiring information you need including diagrams and descriptions are all right there. From "Model Railroad Wiring Tips" to Model Railroad Wiring"
From "Wiring Tips" to "Homepage"